Police and fire crews respond to the scene of multiple stabbings in San Jose (July 30, 2016). 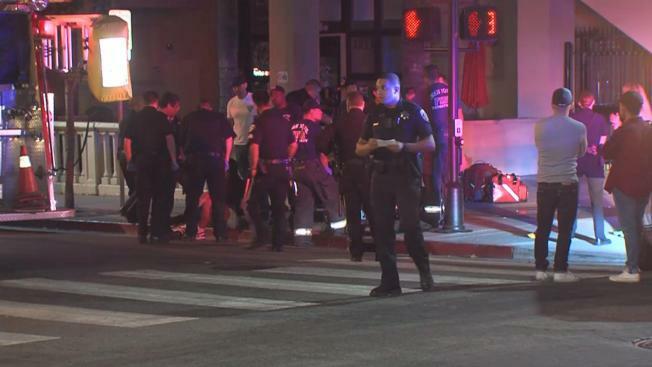 At least four people were stabbed in downtown San Jose early Saturday morning after a fight broke out on the sidewalk, according to police. Two of those victims were reported to have suffered major injuries and were rushed to the hospital to undergo emergency surguery. The two other victims were transported to the hospital as well, police said. The stabbings occurred near the intersection of S Almaden Boulevard and W San Carlos Street around 1:30 a.m., according to police. No other information was available at the time.